When my youngest daughter saw the soup on the dinner table this week, she groaned. Like most kids, she has pretty narrow parameters about the way she likes foods. She’s more adventurous than her sister, but to both of them, cold soup is a raw deal. Nonetheless, that’s the only way to serve this week’s soup, which is none other than Gazpacho. This dish is at once very familiar and very, very fresh, so fresh it requires no cooking at all. And, in light of the heat wave we’ve been going through here, that was a good thing. Gazpacho is a classic and very seasonal soup. Something we modern shoppers have gotten away from since we can get whatever produce we want all year round. If we want tomatoes in January, you’d better believe we’ll get them, but we can also be sure they’ll be trucked in from a long way away. Every fruit and vegetable has a time during the year when they’re at their best. And if you’re making a soup with fresh produce, that’s the time of the year you should make it. I’ve written here before that as a Californian, I noticed a subtle change of seasons but never appreciated the passage of time. I knew it was winter when navel oranges went on display in the supermarkets. But that was the only connection I made between produce and the calendar. Now as I move through the aisles of my favorite grocer’s (it’s Caputo’s if you need a reminder), I see the ebb and flow of produce with every passing month. Each season has its own colors and flavors and those are the ones I buy. You don’t have to be a locavore to care about fresh fruits and vegetables, but if you care about taste, following the seasons is the best option. Summer is the true season of tomatoes, ditto for bell peppers and cucumbers. That’s the real reason I made Gazpacho this week. Although in truth, if I’d waited a few more weeks, this soup would have been even better. 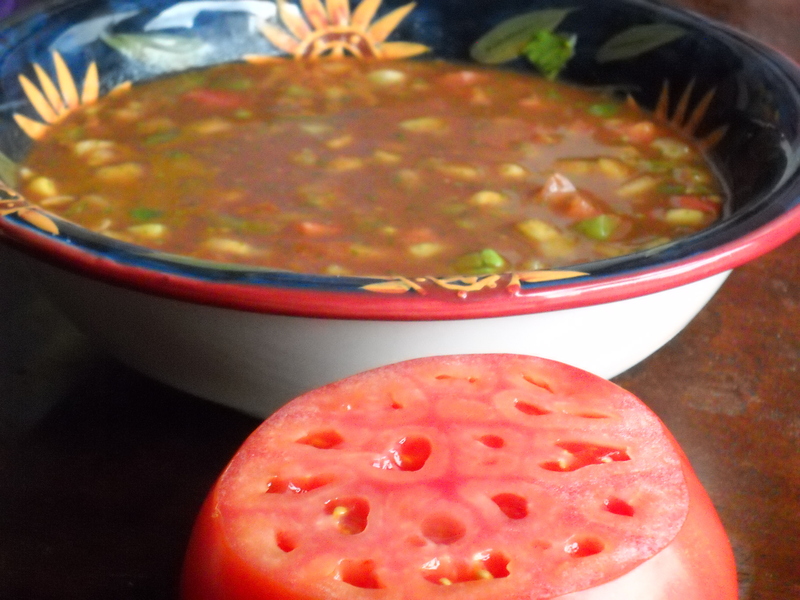 This cold Spanish soup, typically comprised of tomatoes, cucumbers, bell peppers and garlic, has been helping us peasants get through the hot summer months for hundreds of years. I did go off the beaten path a little by adding cilantro and avocados. But these additions only add flavor and richness to the soup. The avocado in particular gives traditional gazpacho a fullness and consistency similar to that of cream or cheese. It also contributes to the soup’s raw goodness. Another great thing about fresh, cold soups is that their temperature allows you to incorporate competitive flavors into a recipe. Whereas warmer dishes heighten their individual flavors, cooler temperatures tend to mute or even mask the different ingredients. As such, cold soup allows cooks to get away with things, e.g. my daughters’ love of avocados allowed me to sneak a whole bowl of fresh vegetables past both of them. Revenge isn’t the only dish best served cold. Bonus: I haven’t tried it yet, but I just read that you can keep leftover avocados from turning brown in your refrigerator by spraying the exposed flesh with Pam or some other spray oil (click here to see). Fat’s a great barrier so it makes sense to me. If anyone out there gets to try it before I do, please leave me a comment about the results. Add the garlic, cilantro and tomato juice to a 3+ quart stock pot and puree the mixture to a relatively smooth consistency (no big chunks of garlic and no big residual cilantro stems). Add the diced tomatoes, cucumbers, peppers and avocados and stir it all up. Adjust the flavor to your liking with salt and pepper. A little bit of salt really brought it all together. Goes great with light pasta dish (my sister made a great rapini and garlic spaghetti, which she still owes me the recipe for) and crusty bread. Note: By now you should realize that I think everything goes well with crusty bread. You’re right, I do think that, but only because it’s true. Image Credit: Photo of an early summer tomato and one of its possible outcomes, by the author. Once again the Soup Blog coolly presents flavors that may give you the chills. Sometimes it’s better to just take the plunge than inching in gradually. Let me know what you think. I’ll be reading and responding. Sounds great, Phil. I have another way to keep avocados from turning…squeeze some fresh lime juice on the surface (make sure it covers the whole exposure). I do that when making guacamole and then just mix the juice in when I’m ready to serve it. Your method sounds great for guacamole, but what about plain old avocado? Or an already made guac? I’ll let you know how the spray works. I just tried it today on some leftover Costco guac. We’ll see what it looks like tomorrow. I forgot to add that I’ve made a Phillip Campbell’s Soup Book with help from Office Max. Now I don’t have to worry about getting moisture on the pages that your dad printed out for me. Sounds like an interesting book. But if you start making money off it, you’ll be hearing from my lawyer. At least you would, if I had a lawyer.